What Happened in Memphis and Good-Day Alabama! I’m back!! Here’s what went down in Memphis. I’m heading to Birmingham, home of Ruben Studdard. And remember, the Katrina Appeal page is here!! Remember, the Katrina Appeal page is here!! You can listen to my voice, as I describe my upcoming day, packing for Memphis. When we got there, the building didn’t say “CNN”, but when I got out of the car and woman came to greet me with a warm smile and she says we had the right place. She introduced herself and said her name was Mary and took me to the ‘green room’. Then, a man and a woman came in to meet me, and when I got up to go meet them and looked at the man, I started screaming. The man, (his name is Mr. Doty) looked just like Nigel from American Idol! He started laughing and Mary who greeted me said “Oh Lord you do look like him!”. Mr. Doty introduced me to the woman, Mrs. Doty, who was his mother. I kept looking at Mr. Doty for a long time saying, “You’re not Mr. Doty, you’re Nigel.” and he just laughed and finally says ok. 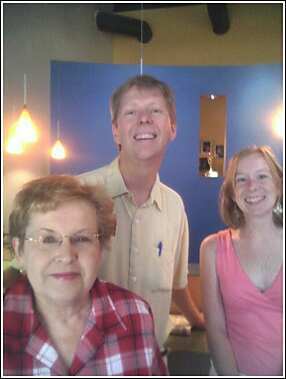 I said, “I have to get a picture of you all”, so I took a picture of Mary, Mr. Doty and Mrs. Doty. Check it out below. After that, we talked for a while, shared laughter and then it was time for my CNN interview –once again in front of the camera , I love it! We did it and I was so excited because I got to talk to my friends at Showbiz Tonight again. After the interview, the driver took me back home to my brother’s house and I got to sit down and eat some ice cream (which is a total no-no for me b/c singers aren’t supposed to eat ice cream… or birthday cake. ) No cake , no sugar, nothing dairy, We’re just supposed to starve! Hahaha. But it’s ok, I enjoyed my ice cream and prepared myself for the next venture. Tomorrow it’s Memphis —get ready, stay tuned, you don’t want to miss this! Remember, the Katrina Appeal page is here. So I immediately said, “Lord, thank you for letting me see another day and please let me make it to this place in time for the interview so I don’t get in trouble for missing it.” Ha Ha . I finally arrived at the CBS studios, the guard greeted me at the door, I expected a warm greeting, but he didn’t know who I was at first, so I had to explain that I was there for an interview with CBS and he then said “Oh, ok” and greeted me with a warm smile and escorted me to the ‘green room’. After waiting in the green room a bit, finally it was time for me to do the interview. I told her, “Don’t start nothing and it won’t be nothing, because I’ll shout on the TV!” and we both laughed. Well, I want to conclude by saying a bit about that eye in the middle of a hurricane and a tornado. You will find that in the middle of both of them, there is a stillness and a peace with no action taking place —there’s just calm and peace in the eye of hurricanes and tornadoes and right now, even though there is corruption all around, I have found God right in the eye of this hurricane. And He has given my family a sense of peace and comfort through all of this and I want to encourage you all that even in the midst of your spiritual hurricane, there is peace. If you have faith the size of a mustard seed, you can speak to the winds and the waves and they would have to calm down. So don’t worry about what you’re going through, a brighter day is on the way. God bless you! Remember, the Katrina Appeal page is here. Hello to the GOSPELflava.com family and friends. It is an honor to be able to provide you with my diary and share with you exclusively what’s going on with me, George Huff. I hope that you are blessed and inspired and touched in some way about how the Lord is working and moving in my life. Tonight I found out different things I have to do tomorrow. I also prayed with several friends about the state of what’s going on concerning Hurricane Katrina. I also talked with some friends about how we can help better the situation and people with food, clothing and shelter because I think that it’s very important. Even though I am a victim myself, I think it is also important that we see the need of others and pull together and help each other out.